See the POSSIBLE and reach the WORLD! Becoming a Vision Partner means that you can see the impact that a worldwide ministry like From His Heart can have around the world ... in bringing people to a saving knowledge of our Lord and Savior, Jesus Christ. Dr. Jeff Schreve is thrilled to invite you to 'see the possible' and become a From His Heart Vision Partner today. Your monthly support will be part of the foundation of this ministry that allows us to share the uncompromising Truth of the Gospel to more people each day. 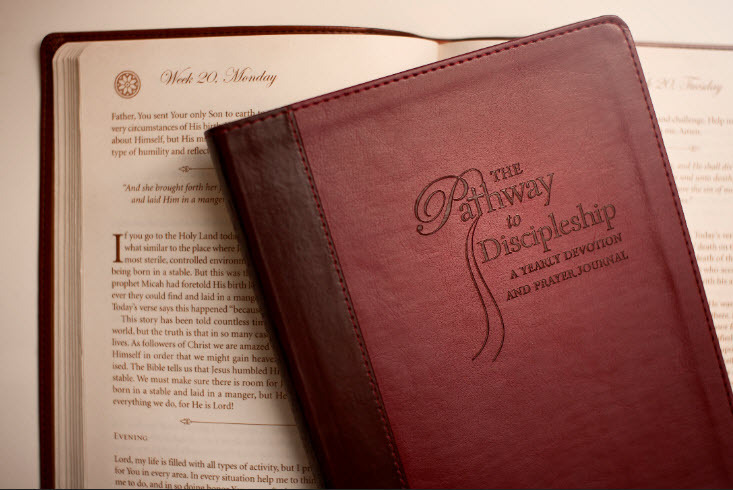 With your first gift today as a monthly Vision Partner, we’ll say thanks with a copy of an inspiring devotional book, The Pathway to Discipleship: A Yearly Devotional and Prayer Journal. Pastor Jeff contributed to this beautiful devotional keepsake wrapped in a stitched faux-leather cover sure to last for years. The daily devotions will comfort and encourage. Plus, you'll have room to journal your thoughts and prayers each day. God bless you for standing with us. Your Vision Partner gift will make an important impact for reaching people for Christ. Thank you. Sign up to get Pastor Jeff's weekly Real Hope email encouragement.